Madagascar is one of the most biologically diverse places on the planet, the result of 160 million years of isolation from the African mainland. More than 80% of its species are not found anywhere else on Earth. However, this highly diverse flora and fauna is threatened by habitat loss and fragmentation and the island has been classified one of the world’s highest conservation priorities. 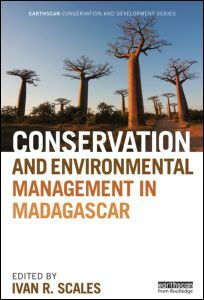 Drawing on insights from geography, anthropology, sustainable development, political science and ecology, this book provides a comprehensive assessment of the status of conservation and environmental management in Madagascar. It describes how conservation organisations have been experimenting with new forms of protected areas, community-based resource management, ecotourism, and payments for ecosystem services. But the country must also deal with pressing human needs. The problems of poverty, development, environmental justice, natural resource use and biodiversity conservation are shown to be interlinked in complex ways. Authors address key questions, such as who are the winners and losers in attempts to conserve biodiversity? And what are the implications of new forms of conservation for rural livelihoods and environmental justice? 11. Tourism, Conservation and Development in Madagascar: Moving Beyond Panaceas?